If you missed EVE: Valkyrie at the PC Gaming Show yesterday, this lovely bit of new footage from CCP Games should help to make up for it. It's two-and-a-bit minutes of furious space dogfighting, ending with the player character taking a fatal shot to their ship's windscreen (or whatever the space equivalent of a windscreen is). As you can see when all the air rushes out, space is cold. Really bloody cold. "See you in the next life" indeed. 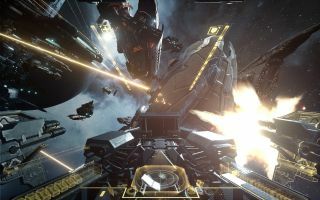 EVE: Valkyrie is coming to the Oculus Rift (and to Sony's Project Morpheus), but it might come to other VR devices in the future. Importantly, Battlestar Galactica's Katee Sackhoff is doing one of the voices.